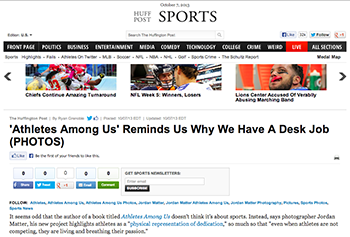 Athletes Among Us featured on HuffPost Sports. It seems odd that the author of a book titled Athletes Among Us doesn't think it's about sports. Instead, says photographer Jordan Matter, his new project highlights athletes as a "physical representation of dedication," so much so that "even when athletes are not competing, they are living and breathing their passion." 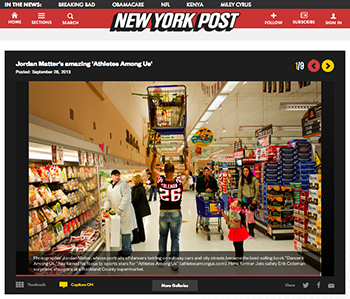 Athletes Among Us featured in The New York Post. 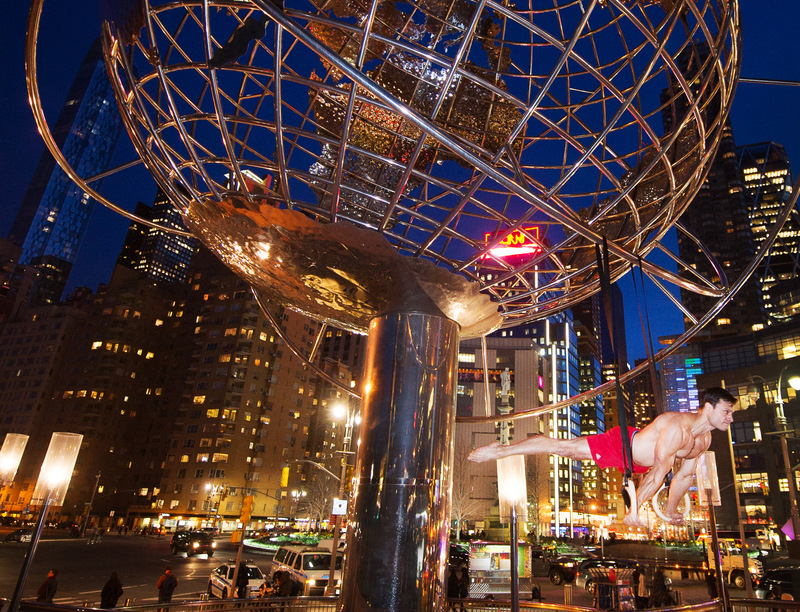 "Photographer Jordan Matter, whose portraits of dancers twirling on subway cars and city streets became the best-selling book 'Dancers Among Us', has turned his focus to sports stars for 'Athletes Among Us''"
Athletes Among Us featured on MSN Now. Photographer Jordan Matter already showed us what it looks like when dancers start busting moves in otherwise normal situations. Now, he's showing us what athletes look like in their everyday lives â?? if everyday involves roller derby on the subway and hoisting people into the air at the gym. Matter plans to publish a book titled "Athletes Among Us," but he says the project isn't just about performing athletic feats in unusual environments. Its about dedication. 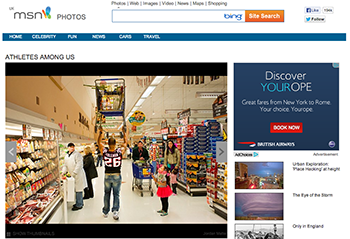 Athletes Among Us featured on Fotomofo. I have a tattoo on the inside of my forearm that reads, "To strive, to seek, to find, and not to yield." It's the last passage from Alfred Lord Tennyson's poem "Ulysses." This, too, is the philosophy behind Jordan Matter's photography series "Athletes Among Us" and "Dancers Among Us." Athletes Among Us featured on Balls. Ever wondered how professional sports stars would handle every day situations? No? Well photographer Jordan Matter did, and he has created a breath-taking collection of photos, titled â? ?Athletes Among Usâ??. Photographer Jordan Matter showed us his project "Dancers among us" look like dancers in everyday situations. This time he deals with athletes in a "normal life." As with the dancers, amazing images are created and shown on Facebook. Whether it is the bodybuilders as shopping or traveling Loangboarder as a supplier, these photos show a very different view of athletes. 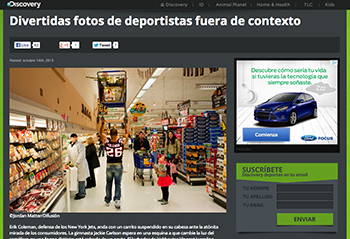 Athletes Among Us featured on Discovery En EspaÃ±ol. What's going on? No, the world has not gone mad. 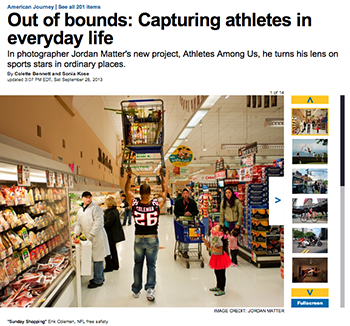 These Athletes Among Us, the recent work of Jordan Matter portraying athletes doing 'their thing' in public. Athletes Among Us featured on MSN UK. Jordan Matter, the photographer behind the wildly popular photo series and book Dancers Among Us, has created another fantastic series. Now, Matter has captured the dedicated and passionate lives of those professional athletes among us - keeping their high levels of dedication and competitiveness throughout their daily lives and tasks. Athletes Among Us featured in The Daily News. 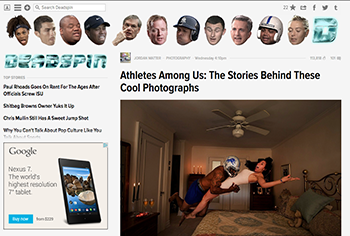 Athletes Among Us featured on Deadspin. Last year the photographer Jordan Matter released a super-cool book called Dancers Among Us. He put dancers in everyday situations - in the middle of a park, a subway station, on a busy sidewalk - and photographed them, out of context, doing their dance moves. As a follow-up to the book, Matter has released a new series of photographs, Athletes Among Us. Matter agreed to annotate some of his photos for us. Athletes Among Us featured on anchorfan.com. Jordan Matter is the photographer behind the best selling book Dancers Among Us (DAU) and the New York resident is set to replicate his first book's success with the follow up Athletes Among Us (AAU). Capturing extraordinary people in day-to-day activities has given Matter a niche and unique body of work that contrasts the athletic with the somewhat mundane. His work has captured the imagination of his audience and catapulted his profile to meteoric levels all over the world thanks to an unforeseen "viral explosion", as the author puts it. 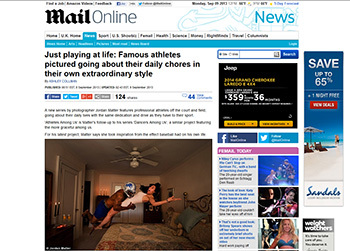 Athletes Among Us featured on Daily Mail. A new series by photographer Jordan Matter features professional athletes off the court and field, going about their daily lives with the same dedication and drive as they have to their sport. 'Athletes Among Us' is Matter's follow-up to his series 'Dancers Among Us', a similar project featuring the more graceful among us. Athletes Among Us featured on HLNTV. "The most common reaction to seeing Jordan Matter's photography is a bewildered, "How did he do that?" Or perhaps, the question should be more like "How did they do that?," since Jordan's spectacular subjects seem able to twist themselves into a variety of positions that seem near-impossible to the rest of us." 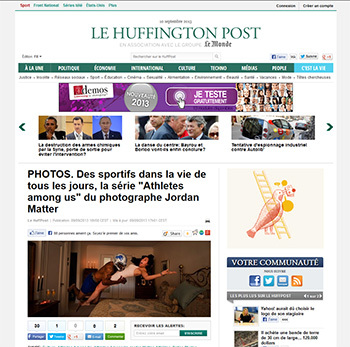 Athletes Among Us featured in Le Huffington Post. Jordan Matter likes to stage his models in unexpected environments. After his hit series "Dancers among us", our fellow American HuffPost had relayed this American photographer currently working on a project entitled "Athletes among us". As its name suggests, it is photographing sport currently practicing in their respective disciplines, but in everyday surroundings: the street, shop, stairs to an underground station or even a room bathroom. Athletes Among Us featured on JeuTeteMatch.com. In 2012, the giant American bookstore Barnes & Noble had ranked Dancers among us among the best books of the year. Oprah Winfrey and the New York Times agreed. Today photographer Jordan Matter returns with a new series of photographs called Athletes among us, which should also soon be adapted into a book. 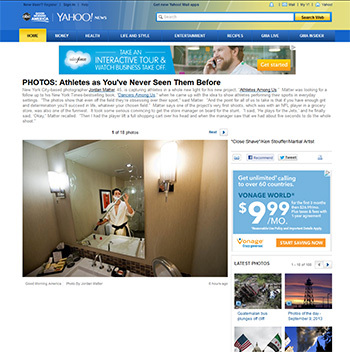 Athletes Among Us featured in Good Morning America on Yahoo. 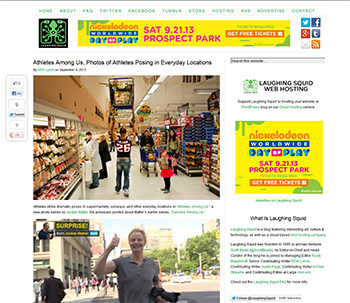 Athletes Among Us featured on Laughing Squid. Athletes Among Us featured on Slate Magazine. How does one top such an astoundingly successful project as â? ?Dancers Among Usâ?? That's what photographer Jordan Matter asked himself after his collection of photos documenting dancers in everyday situations made it to the New York Times best-seller list and earned international media attention. The answer, he found, was to capture more inspiring, physically gifted people displaying their talents in public. So he turned his attention to athletes. Athletes Among Us featured on Babble. These incredible photos by Jordan Matter show us what life might look like if the athletes and dancers among us performed their jobs in everyday situations. What would happen if a football player tackled his wife every night when it was time for bed, or if a ballerina went to a construction site with her pointe shoes on? Athletes Among Us featured on SLR Lounge. 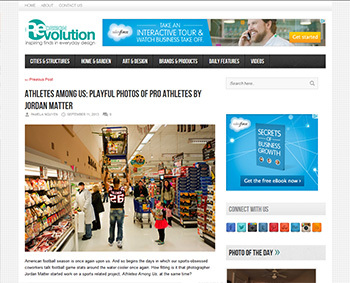 Athletes Among Us featured on Redesign Revolution. American football season is once again upon us. And so begins the days in which our sports-obsessed coworkers talk football game stats around the water cooler once again. How fitting is it that photographer Jordan Matter started work on a sports related project, Athletes Among Us, at the same time? 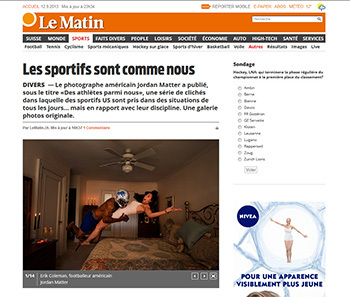 Athletes Among Us featured on Le Matin. American photographer Jordan Matter has published under the title "Athletes from us," a series of photographs in which U.S. athletes are caught in everyday situations ... but related to their discipline. Athletes Among Us featured on bfmtv.com. What if athletes never cease to be athletes? They wore their races like dumbbells, moved by climbing along the signposts or read while doing a graceful dance move? Photographer Jordan Matter has tested this principle with dancers. He expanded with athletes in general. 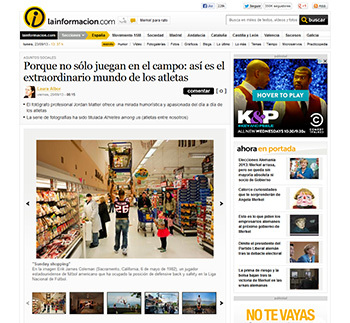 Athletes Among Us featured on lainformacion.com. "Athletes Among Us is not about sports," says Matters. "Athletes are a physical representation of the dedication but it can be applied to any field. These photographs show that even when athletes are not competing, they are living and breathing their passion," he says. "They remind us all that to achieve our goals requires tenacity, never give up and continue to strive for excellence." Athletes Among Us featured on wepic.com. 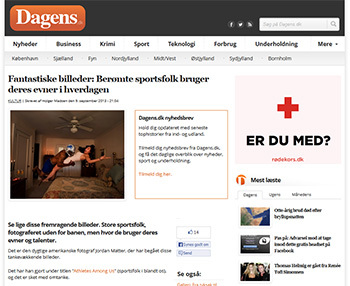 Athletes Among Us featured on Dagens. Look at these great pictures. Great athletes, photographed off the field, but using their skills and talents. It is the talented American photographer Jordan Matter who committed these thought-provoking images. He has done so under the title "Athletes Among Us", and wisely so. The idea is that these famous athletes have special abilities and skills that they use in their sport. But here Jordan Matter taken these skills into the athletes' daily lives, and the result is a series of both fun and impressive photos. 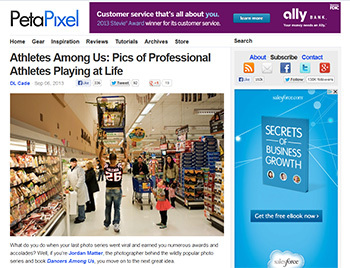 Athletes Among Us featured on PetaPixel. What do you do when your last photo series went viral and earned you numerous awards and accolades? Well, if youâ? ?re Jordan Matter, the photographer behind the wildly popular photo series and book Dancers Among Us, you move on to the next great idea. 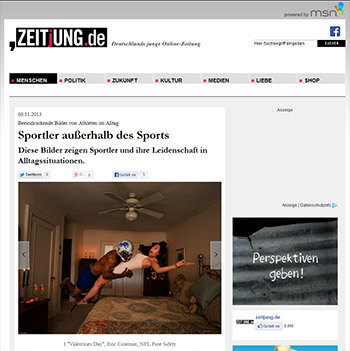 Athletes Among Us has been featured on German photography magazine augenblicke. Athletes Among Us will be featured as part of a solo exhibition at the Savina Museum of Contemporary Art this summer in Seoul, Korea. Â The show will also feature images from Dancers Among Us and Circus Among Us, and will run from July 15 through September 22. Tell me a little about your skills. Do you have an idea for a photo?